As technology becomes increasingly pervasive, its role in shaping the context of learning continues to evolve. This requires lecturers to reconsider their pedagogic strategies to effectively integrate the use of technology into learning (Fisher & Baird, 2005). Research into defining student approaches to learning has led to a range of learning models being proposed and widely adopted. 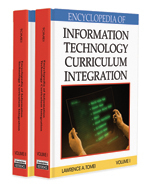 Such models have been largely developed in isolation from advances in the use of information communication technology (ICT) in education (Sadler-Smith & Smith, 2004). The use of ICT challenges established learning models, in the same way that businesses have had to adapt to the changing needs and demands of the e-consumer. This article seeks to explore the challenges that ICT poses to learning models and considers future trends in defining the stages of online learning. Context Sensitive Computing: Access, delivery, and presentation of resources and content using communication technology adapted to situational and personalisation factors. The system tailors the selection of material to be presented to the student to meet the particular needs and preferences of the specific student and the device being used. For example, the learning system recognises that a student is accessing the environment using a mobile phone rather than a computer. It selects material that is directly relevant to the specific student and to presentation via a mobile phone, rather than a computer (e.g., not presenting large documents). E-Moderator: Someone who maintains an online learning environment for the benefit of participators. The e-moderator should be familiar with the capabilities of the learning environment, and may have additional privileges to participants, for example, the loading of learning material and learning objects and the creation and moderation of forums (i.e., deleting inappropriate postings and the enrolling/unenrolling of students). Managed Learning Environment: A managed learning environment combines all of the aspects of a virtual learning environment with a management system to hold extended information about participants and e-moderators. A managed learning environment can contain student contact information, details about courses and modules which the student has enrolled on, and grades/awards achieved as well as course materials and asynchronous forums. Virtual Learning Environment (VLE): A VLE is an environment which is accessed using Web based technologies, either across the Internet or a corporate Intranet. The learning environment typically provides areas for participants to engage in asynchronous communication, allow assessment of the students, and provide learning material in html or other Web technologies (such as Flash or Shockwave). Participator: Someone who participates in online learning. The term participator prevents the categorisation of the person into a term such as student, trainee, or delegate, which some participants may feel uncomfortable with. Asynchronous Communication: Communication through a technology system (computer and communication network) which permit the sender and the receiver to be separated by time. This results in a delay between sending and responding to the communication. Examples of asynchronous communication systems include e-mail, online forums, and cell phone short message service (SMS) text messaging.